What do I knit next? Ah, Charlotte. Just as beautiful as the first and second times I knit you. This one, being much heavier yarn, has a really nice weight and warmth to it without being stifling. Would it be odd to wear my grey Charlotte as a scarf with my grey coat? Vneck’s almost done too – just need to figure out what to do with the neckline and weave in the ends. Hmmmm. Ribbing? Or just simple single crochet? So….what do I knit now? I’ve got shawl options – flower basket shawl outta my handspun, leaf lace shawl with elann baby cashmere. I’ve got sock options – Pomatomus from knitty in Cherry Tree Hill? Uptown Boot Socks in Knitpicks Essentials? Obviously, that’s not ALL the sweater yarn I’ve got, but it’s what I feel like working with. One of those. Sorry for the rambles. I’m sick at the moment, blame it on that! I should go make some soup. I love your charlotte’s web. It’s really cool in the solid color and it’s giving me ideas….Love your blog! The charlotte is lovely. I love the solid color. When I can’t figure out what to knit, I just make a felted bag. It’s my mindless knitting while my brain works on what to do next. Hey, I am sick too. I felt like I have been in a fog all day with this cold. So the V-neck sweater is almost done and your looking for the next project. Hmmm…since Springtime is coming, how about something lighter weight with maybe a cotton or cotton blend type of yarn. I would love to see what kind of tank top you could come up with. I am in the beginning of one now. Charlotte looks gorgeous. And, I vote for using your handspun next–it’s working for me! wow! charlotte’s web looks so different in a solid color. i love it! Charlotte’s Web looks beautiful! I like it more in the solid than in any of the variegated yarns I’ve seen. V-neck very attractive too. 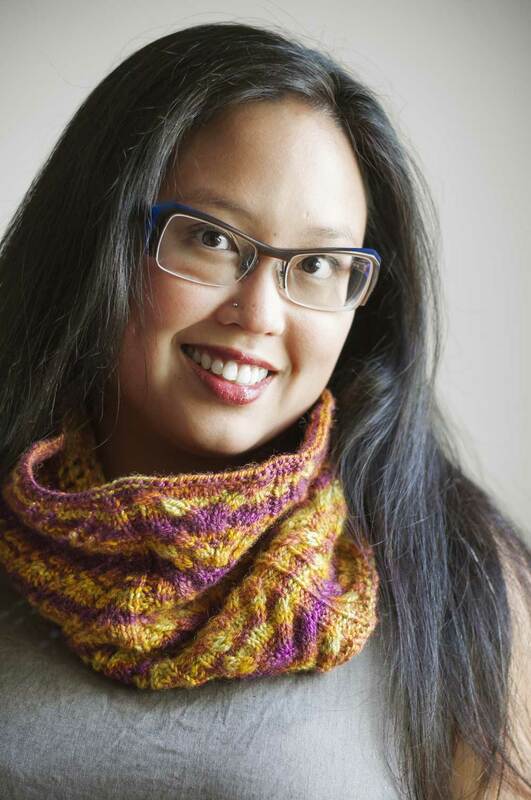 You are such an astoundingly fast knitter – how do you do it? I’m starting to knit lace myself and am having a terrible time of it. The Charlotte look extraordinary in a solid color. You can see the pattern and the geometry. Must admit that though I love them on the skein, I am rarely a fan of handpainted or variegated yarns when actually knitted up unless they are quite subtle. That said, I may buy kiogu this week for a clapotis. Keep knitting. I’m a big fan of your knitting and your blog. Charlotte’s Web is beautiful. You have been a very busy knitter. Definitely ribbing on the v-neck – to balance the bottom and the sleeves. Charlotte looks great – love it in a solid color. You’ve reminded me how much I like the Charlotte in solid colors. It’s a beautiful pattern and this way you can SEE it. charlotte is absolutely gorgeous. and thanks for showing me what zephyr in steel looks like! i love it. i’m starting a lace leaf shawl in knit picks baby cashmere this week! but its for my new sister in law as a wedding present… she reads the blog so unfortunately i have to keep it a secret from the general public until june. if you decide on this one, we’ll definitely have to compare notes! delightful shawl :) hope you feel better soon! Your Charlotte’s Web is indeed lovely! It’s nice to know there are others out there that knit the same shawl again, like me. By the way, how do you manage to knit so fast? You work, you’re a student and so on. Do you have a technique that has helped speed your progress? *gasp* it’s beautiful…I didn’t know Charlotte had that gorgeous pattern until I saw yours! Amazing. The multicolored ones kind of obscure it.